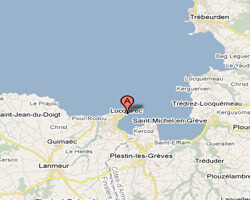 Locquirec is a nice small seaside resort located on the peninsula that closes the Lannion bay. At the seaside you can find several beautiful sandy beaches, one facing south. From the Locquirec headland you have views of the entire west pink granite coast, from island Milliau to Plestin-les-Grèves. 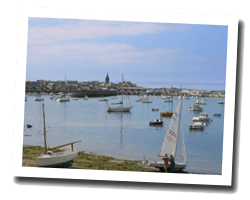 In Locquirec enjoy a seaview holiday rental. Apartment at 1st floor. Balcony. 4 rooms House 90 m2. Terrace, garden with outdoor furniture, deck chairs and barbecue. View of the sea and the beach. 3 rooms House 55 m2. Terrace, garden with outdoor furniture. Distance to the sea: 10 m. distance from town centre: 1200 m. Nice view of the sea and the rocky coast. Direct access to the sea.